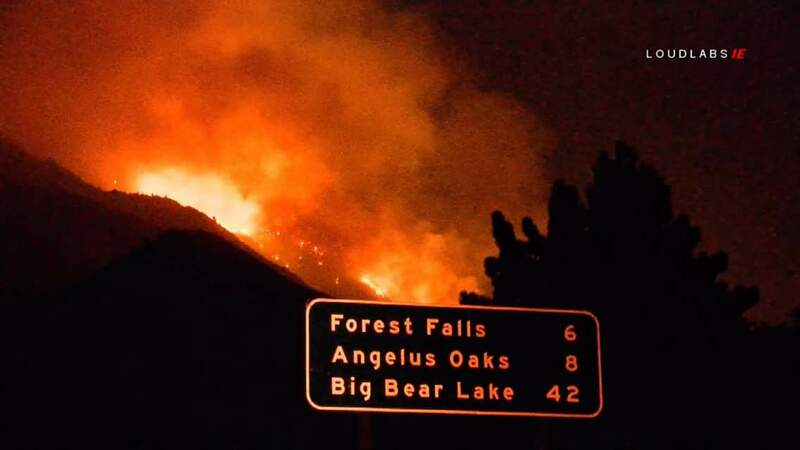 Overnight fire footage was shot along Highway 38 and Valley of The Falls Drive between 11:30pm and 1:00am. According to the US Forest Service, Firefighters from multiple agencies battled record high temperatures and dry conditions in their attempts to control several brush fires on the San Bernardino National Forest. The Valley Fire quickly grew to 1000 acres as of 8:00pm after starting at 1:42 in the afternoon. US Forest Service, CAL FIRE, San Bernardino County Fire and San Bernardino County Sheriffs are in Unified Command, working together to suppress the Valley Fire. Mandatory evacuation orders were issued for the community of Forest Falls by the San Bernardino County Sheriff’s office. 1,000 residents and 500 children from area camps were evacuated. Structure protection and security are in place if winds push the fire closer to the community. An emergency shelter for displaced residents opened at the Inland Leaders Charter School, 12375 California Street in Yucaipa. Highway 38 is closed to all traffic from Bryant Street in Yucaipa, to Lake Williams Drive near Big Bear. Several trail-heads and recreation sites in the Forest Falls have been closed. A specialized Incident Management Team has been requested by the Forest Service to manage this fire. As of 1:00am no new fire information was available.